Can you hit floor 279 for me please? I would like to visit Dubai sometime, if for no other reason than it seems like one of the most peculiar places in the world, a Las Vegas of architecture. If it's not Agassi and Federer playing tennis on the helipad of a hotel, or the world's tallest tower, the Burj Dubai, it's news that Hyder Consulting is designing a structure that will be twice the height of the Burj Dubai, or nearly one mile tall. 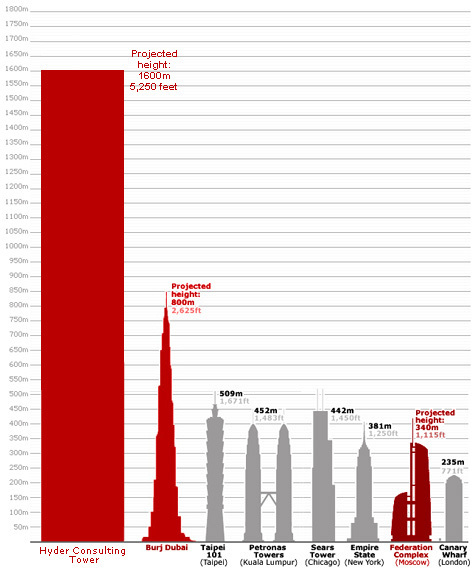 BLDGBLOG whipped up a graphic to illustrate how this building would fit in with the world's other tallest structures. It is sublimely ludicrous.